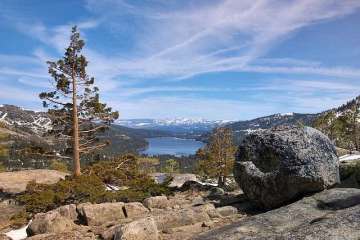 Donner Lake is located right off Interstate 80 adjacent to the town of Truckee so Donner Lake real estate includes lake front and lake access properties with a convenient location. Donner Lake State Park is on the East End of the Lake and the public beach is at the west end of the lake. Donner Lake real estate is comprised of lake front properties on the south and north shore, cabins that are within easy walking distance of the lake and split lakefronts which are homes across the road from the lake with their own pier. There are public docks that can be used for shorter durations so you can walk from your home to one for easy use. Lake front homes run from around $1 million to $5 million. There are older original cabins and new custom homes on the lake. The north shore is the sunny side of the lake and the south shore provides quiet ambiance and that summer cabin feel. Smaller cabins off of the lake start around $300,000. There are vacant lots available for your dream home, lakefront condominium projects and other multi-family opportunities. Donner lake real estate for sale is your opportunity for lake life. Donner Lake is a great place for early morning water skiing and wake boarding. There is a Donner Lake Property Owners private beach and dock area that has boat storage, West end public Park and Rec beach for swimming, tennis and BBQ’s, Tahoe Donner subdivision’s private beach facility features a beach, boat launch, docks, swimming platform and water sports rental facility. The State Park facility with camping, picnic and swimming area is located next door. Sugar Bowl ski resort is located 15 minutes right up Old Hwy 40. You can also access the Pacific Crest Trail from Old 40. With recreational opportunities such as water sports, skiing, back country skiing, hiking, biking, restaurant and fishing, Donner Lake real estate is calling your name. We’ve helped over 2,200 families find their ultimate vacation home or primary residence. 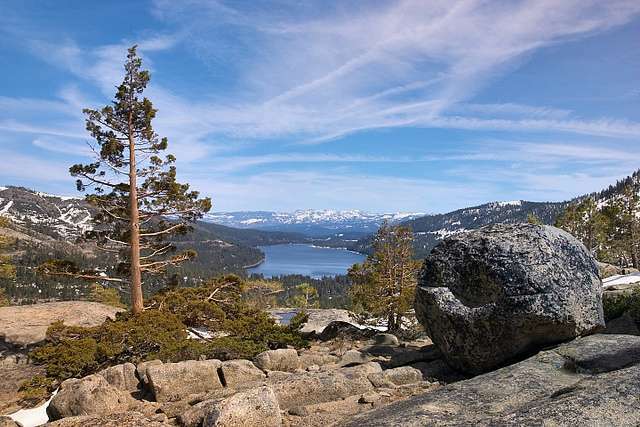 Find out why Donner Lake real estate is an opportunity waiting to be discovered. Contact us to become another Davis Yoder Group satisfied customer. It’s a premium club made up of people who have sought out the best and found it.